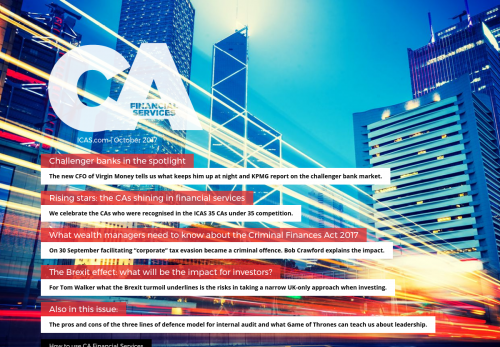 The new CFO of Virgin Money tells us what keeps him up at night and KPMG report on the challenger bank market. We celebrate the CAs who were recognised in the ICAS 35 CAs under 35 competition. On 30 September facilitating “corporate” tax evasion became a criminal offence. Bob Crawford explains the impact. The Brexit effect: what will be the impact for investors? For Tom Walker what the Brexit turmoil underlines is the risks in taking a narrow UK-only approach when investing. The pros and cons of the three lines of defence model for internal audit and what Game of Thrones can teach us about leadership.